The Fashionable Bureaucrat: Celebrate good times, COME ON! Howdy! I spent the weekend at home with family celebrating Mother's Day, my BIL's birthday, and my birthday, which is on Wednesday. I got all my presents yesterday so I won't have anything to open on my actual birthday. BUT, it also happens to be International Fluevog Day so maybe I need to buy MYSELF a present? Because I need another pair of shoes like I need more caffeine at 8pm. 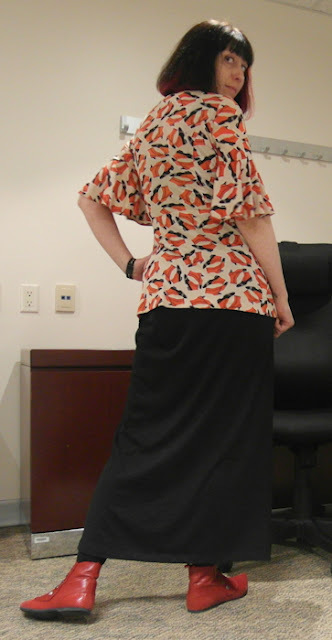 Here's my outfit from Friday, May 10. My "super secret" lunchroom isn't so secret after all so I found an empty meeting room. 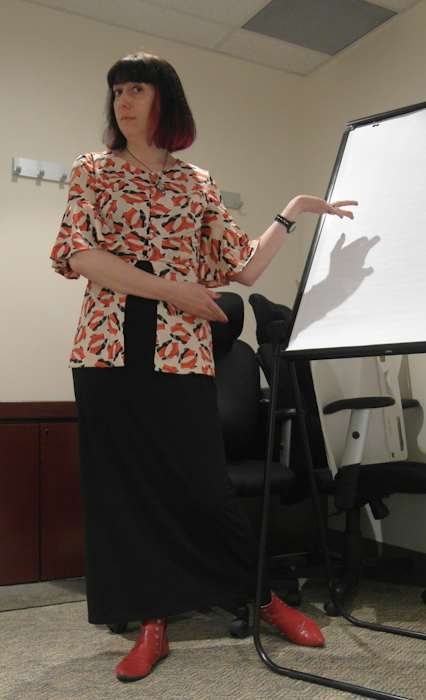 I was making shadow puppets on the flip chart. See, I made a left hand! This dress was uber cheap but I can see myself wearing the hell out of it this summer. It's just a plain black jersey maxi dress but it's so comfortable and easy to layer things over. Like this top. And I had to wear my spatty boots with my spatty top. I was super comfortable all day, and pretty darn cute. True confessions? I wore the dress again on Saturday and again tonight. Maybe I need to get another one in grey or red? Love those booties, especially with the great top! Hee, well done on the shadow puppet. Hee! I love your background and posing. Those boots are supremely cute. I think if you're getting that much wear out of the dress, it would be a good idea for another color. lovely booties and love that they match your top print!, fabulousness! It's fabulous. And I love the boots. And I'm always impressed with your style. Go and get more dresses in other colours as a birthday present. I cannot stress enough the importance of duplicates. It does look like a fantastic layering piece, particularly with the spats theme. Yes, get the dress in grey and red, what are you waiting for? I feel you could have made a far ruder shadow puppet for us, Megan, please try for your next photo shoot!